A well-crafted expense policy can save both employers and employees valuable time. Are you looking for insights to create a comprehensive expense policy? Companies formulate an employee expense policy with the idea of making employees aware of the rules and regulations concerning their expenditures. It contains detailed guidelines for claiming reimbursements and responsibilities of approvers and claimants along with a list of reimbursable expenses. However, this policy is a lot more than just pages containing a long list of dos and don’ts. It is the company’s code against fraud, and the company expects every employee to abide by these policies strictly. Clarity: It is a fair and transparent way for the organization to tell its employees what they will and will not be reimbursed for. If employees consider the policy as being fundamentally fair, it prevents them from inclining towards fraudulent practices and turning expenses into a breeding ground for low morale, discontentment, and exaggerated claims. Regulations: The lack of an expense policy means the company has no control over what amount of money is being spent, for what purpose and by whom. Having an expense policy that spells out what can be claimed and having the employer police the spends allows the company’s finance or revenue teams to view cost leakages and determine budget cuts. Efficiency: Having transparent and fair expense guidelines inculcates good practices among the employees and expense reports created tend to clear and error-free. Furthermore, new employees need not be trained or educated about the way reimbursements are handled in the company. Surveys prove that implementing an expense policy reduces the travel and entertainment costs by upto 20%. Clearly, companies do require an expense policy to ensure that they save as much money as possible. However, it needs to be an effective and efficient expense policy that thoroughly covers all your business and revenue goals while being comprehensible and clear to your employees and the teams that process expense reports. The easier the guidelines are to read, the more your employees will understand and assimilate. Use simple and comprehensible language and avoid corporate lingo. Ensure you provide only the information that is relevant. For example, predetermined mileage rates and project-specific criteria for reimbursements. Use a tone that promotes a user-friendly impression rather than a forceful one that might negatively impact your corporate culture. Effective policies always aim to be fair. No employee should have to pay out of his/her pocket for costs that he/she can claim back. Create a policy that not only you but also your staff find fair. Ask for feedback from time and time and see if you can handle their concerns and queries promptly and generously. Make sure your policy is a collective contract and not something that is imposed on your employees. To be fair to your employees, try to be flexible with the cost limits you set forth. For example, hotel fares or taxi fares might not be the same in all cities, consider including a small region-specific chart with the acceptable rates. Ensure employees notify the required approvers before making any bookings. Keep in mind that the company holds the right to say no if in case the expenditure is too extravagant. Your expense policy should be easy to find by your employees. Opt for smart methods to ensure your employees will look through and understand it. Put it on the intranet and send out emails urging your employees to give it a glance. Use text messages or push notifications to increase visibility. Consider printing out a copy for your employees as well. Your managers can help you avoid fraud at the very ground level. List down their responsibilities and what is expected of them when approving an expense. Make sure they are familiar with the content, the significance of compliance, and the reasons for implementing the policy. This way they can enforce the rules and ensure fraud is in check to the best of their abilities. Lastly, no expense policy is good to go for the entire lifetime of a company. It needs to be revised and amended regularly. Take into account inflation, legal updates and the condition of the company while making any changes. See to it that these changes are publicized to the management. Research proves one-third of the employees have submitted expense reports that contained at least 5 errors. This does not mean expense policies are not perfect, or that employees just won’t abide. Instead, it’s indicative of the scope of improvements and optimization in your existing policy. The best solution for this is automating your expense reporting and expense policy workflows. Research shows that policies which are built into expense reporting software improve compliance by 44%. Concurrent policy checks on automated expense management systems help employers ensure no expenses violate the policies. When an employee records a business spend, the software will check for policy violations in the real-time. If there is a breach, the expense will be flagged, and the individuals notified. The employee will be alerted and asked to clarify or change the expense to match the guidelines. The manager will also ensure the necessary changes are made before approving the expense. Finance teams can also view the audit trail as and when required and gain insights accordingly. Ultimately, these systems not only reduce the amount of time spent on manual policy-violation checks but also curb costs and prevent fraud. Keep your staff happy and burden-free without compromising on your expense policy or the company bottom line. 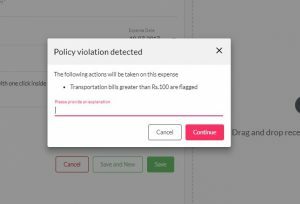 Want to know more about synchronous policy checks? Start your free trial today!